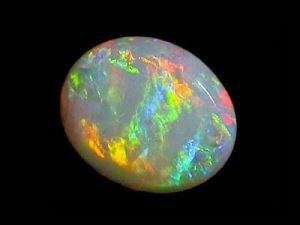 Writers have compared Opals to volcanoes, galaxies, and fireworks. Admirers gave opals poetic names like Pandora, Light of the World, and Empress. This Gem is usually of a commercial value, and its most beautiful specimens have nothing to envy for the Big Three (Emerald, Ruby and Sapphire). Most of the Opal deposits were formed 15 to 30 million years ago, except for the Australian ones at Mintabie dating back to 400 million years ago. On the one hand, Opals fascinate the minds with their play of colors, but on the other hand, Opals are the Gems with low stability and low toughness. 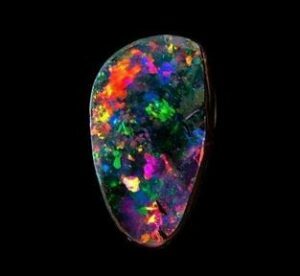 In fact, Opals contain some water as a part of their structure, and when it loses water over the time, it tends to crack. Precious Opals are formed in desert areas with heavy seasonal precipitation and silica-rich rocks. During the winter, heavy rains cause the water table to rise. Water picks up silica from the sandstone and carries it down through the rocks. This silica-rich solution fills the cracks and voids under the aquifer. Summer draughts affect the height of the under groundwater levels. As the water evaporates, it leaves behind a silica deposit that hardens into precious Opal. This whole process takes millions of years. Despite the evaporation, the Opal always has water content of approximately 3 to 10%, and in some rare cases even 20%. There are two categories of Opals: Precious Opal and Common Opal. 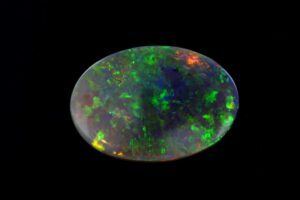 Opals displaying play of color are known as Precious Opals and Gemstones lacking play of color are known as Common Opals. Opal does not have a crystalline structure. In fact, using an electron microscope with 30.000x magnification it was discovered that opal is made up of billions silica spheres, staked in a uniform grid like oranges in the boxes. In the Common Opals the silica spheres are arranged at random, and in the Precious Opals they are arranged in a regular rectangular pattern. How many types of Opal are there? There are really many varieties of Opals, but only a few could be considered as jewelry. Below we mention the most famous: Black Opal, White Opal, Crystal Opal, Water Opal and Fire Opal. On the other hand, there are various Synthetic Opals, and most famous among them is called Gilson Opal.